Reindeer hot dogs for sale at Kauppatori. Finland is the quiet player in Arctic affairs. It lacks the long Arctic coastlines of Russia, Canada, the United States, Norway, and Greenland/Denmark, making it a somewhat secondary player in many Arctic discussions. These increasingly center on issues concerning solely the Arctic Ocean (fisheries, shipping, and continental shelves, for instance) rather than the Arctic as a maritime and terrestrial region. Yet Finland still possesses many Arctic interests, which Professor Lassi Heininen, of the Arctic Centre at the University of Lappland in Rovaniemi, explains over at Geopolitics North. Finland released its Arctic strategy in 2010, and the Prime Minister’s Office released an updated version in 2013 (PDF). Whereas the previous strategy focused largely on external issues, the updated strategy takes into consideration many internal ones as well like business opportunities and the environment. The Prime Minister’s Office justifies the update’s necessity by stating, “Underlying the review of Finland’s Strategy for the Arctic Region is the increased significance of the region and a growing perception of the whole of Finland as an Arctic country.” The strategy has four pillars: “an Arctic country, Arctic expertise, Sustainable development and environmental considerations and International cooperation.” For those of you familiar with Canada’s Northern Strategy document, released in 2009, this should strike a chord, for that document, too, has four pillars (yes, the exact same word is used). Canada’s concerns are quite different, however: exercising Arctic sovereignty, social and economic development, protecting the Northern environment, and improving and devolving Northern governance. Finland is an Arctic country. The Arctic identity of Finland has been shaped by climate, nature, geography, history and experience. Finland as a whole is a truly Arctic country: after all, one third of all the people living north of the 60th parallel are Finns. The Saami’s status as the only indigenous people within the European Union is duly recognised and their participation in issues affecting their status as indigenous people is ensured. The northern parts of Finland must remain a stable and secure operating environment. I always find it curious how different governments legitimize their claims to the Arctic. In Finland’s case, it’s less to do with absolute or even relative territorial size and more to do with the overall proportion of people around the world living north of 60 who are Finnish. Fortunately, Helsinki, with 603,000 people, sits at 60°10′N, 24°56′E – giving a big boost to the Finnish proportion of north-of-60 denizens. 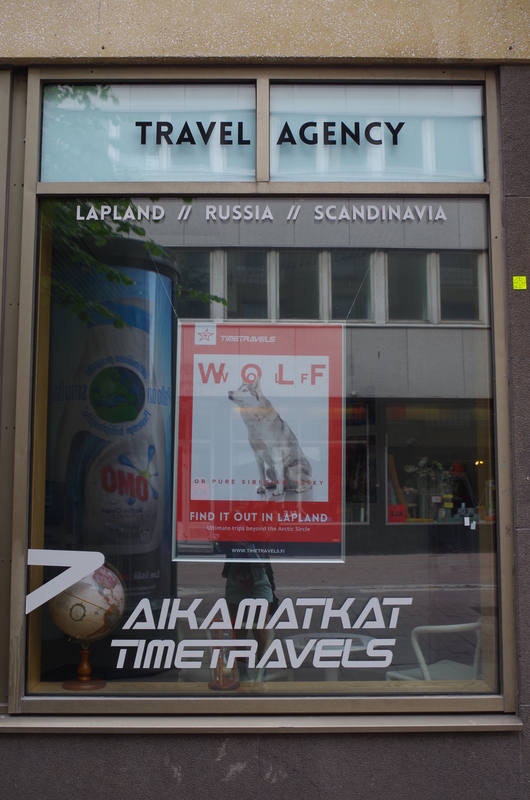 Here in the nation’s capital, there are a few signs of Finland’s Arctic nation-ness, although you might have to look twice to catch them. A sci-fi, retro-looking tourist (or timetravelling?) agency advertises trips “beyond the Arctic Sirkel.” A small street leading up towards the famous rock church is called “Aurorankatu/Auroragatan” (with all street signs being in both Finnish and Swedish, Finland’s other official language). But generally, I noticed that the main way in which the country appears to be an Arctic nation has to do with cuisine. (Or, that may just be due to the fact that my eyes are often larger than my stomach.) There are translucent, golden-orange cloudberries – “Arctic Forest Berries,” as the vendor’s sign announces – which only grow in Arctic and alpine tundra. There are reindeer hot dogs and deep-fried vendace served with potatoes (“the Finnish fish and chips”). Vendace are a small lake fish from Lappland, which is the country’s northernmost region. This, too, is where many of the Sami live. The Sami have little visible presence in Helsinki that I noticed, although it’s possible I wasn’t looking in the right places. Indeed, the Finnish government, under criticism from the United Nations, still has not ratified the Indigenous and Tribal Peoples Convention (ILO 169). Among the other countries with Sami populations, Russia and Sweden also still have not, but Norway has. Finland’s Arctic strategy explains, “Prime Minister Jyrki Katainen’s Government Programme singles out the ratification of ILO Convention No. 169 on Indigenous and Tribal People as one of its objectives for the electoral period 2011–2015. Work is in progress to explore the preconditions for such ratification.” In January 2015, however, it was decided that ratification was tabled until the next government. This drew protests from the Finnish Sami Youth Organization in front of Parliament in Helsinki – a time when the Sami were clearly a visible force in the capital. Fried vendace – Finnish fish and chips – at Market Square. While the Sami are not that obviously visible in Helsinki, the Russians definitely are. Granted, I have only been here for two days, but Russian people, architecture, and influence are very east to spot in comparison to Sami heritage. Finland may not have an Arctic coastline, but it has a 1,340-kilometer border with Russia – the longest of any Arctic state. From 1809 until its declaration of independence in 1917, Finland was an autonomous region within the Russian Empire. Today, there are a few Orthodox churches around town, onion domes, signs in Cyrillic, and seemingly thousands of Russian tourists milling about, brought by train, plane, and ferry. I imagine many of these tourists must be quite wealthy if they can continue to afford to travel to a Eurozone country despite the precipitous fall of the ruble. 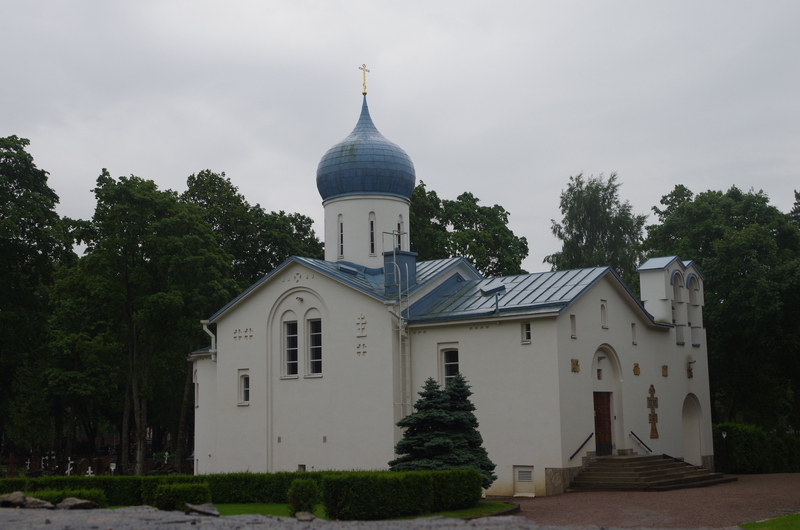 A Russian Orthodox church in Helsinki. So to my uneducated eye after a very brief stay in Helsinki, Finland to me seems a country pulled both north and east. This, perhaps, is why its strategy document makes reference to the “North-East Passage” rather than the more typical “Northern Sea Route.” Finland is also drawn to the Far East. Finnair operates direct routes from Helsinki to interior cities like Chonqing and Xi’an. The airline promotes these routes by advertising, “Our route is geographically the shortest way between Asia and Europe” and “Finnair flies the shortcut between Asia and Europe.” If Finland can’t directly access the Northern Sea Route – that other shortcut between Asia and Europe – it will get you there by flying. I myself am heading east across the Russian border today, so Cryopolitics will be on hiatus in the month of August. When I return, I’ll hopefully have many more stories of the (Russian) Arctic to tell. Great article. I enjoy reading your Arctic related posts. I was wondering if you would be keen on contributing via our EMergingEquity.org platform. That would give you exposure to our readers. I am happy to offer you a WordPress Contributor level … You can reach me via Twitter @ETFalpha. Thank you for the photo of a Finnish “fish & chips” meal. Now I know why McDonald’s is packed in Helsinki for lunch. How was the those “fish and chips”? The potatoes look like the kind one finds growing in Greenland. lower water for the baseline of the 12 nmi territorial sea. See: Bernhandt, SOVEREIGNTY IN ANTARCTICA . 5 Cal.W.Int. Law 297, 309, fn. 47. Anyone have an idea as to how the baseline was fixed for this report to the 12 nmi Territorial Sea around Wrangell Island in the Arctic Ocean to the North of Siberia? Pingback: Eye on the Arctic » Blog: Moscow, where polar bears stalk the streets?